Very beautiful and very big Clear Beach Ball part of our Signature Series. These are all clear with six panels and a Boston Valve (Screw Type Valve) and a small repair kit just in case. Individually packaged and ready for shipment. 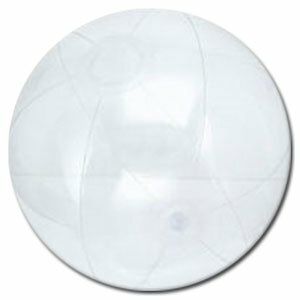 This beach ball is clean with no printing. If you have any questions about this product by Beachballs, contact us by completing and submitting the form below. If you are looking for a specif part number, please include it with your message.